Enjoy! But, really, how good can this ensemble really be. They've actually got a ringer playing mandolin, and they aren't listed on the KlezmerShack :-). HaZamir uninspiring in "Jews and Blues"
After reporting on so many excellent concerts over the last month or so, it seems appropriate to mention one that didn't work well for me—this afternoon's concert by HaZamir Chorale and a local Boston soul/funk band, Earthkwake. Titled "Jews and Blues", the concert followed a theme similar to last year's combination of the Workman's Circle Chorus and a Black Gospel group. This year, the chorus was the often-excellent Hazamir. The concert started on a problematic note for me as HaZamir took the first shift and went nicely through some mildly interesting, mostly Israel-of-the-Fifties-and-Sixties-inspired numbers. One number, which featured chanting the names of some Israeli cities and things to do in them/how to arrive, in Hebrew, could have been interesting, but never overcame the limitations of good, but not great singers. It was a "pop-ish" set, which shouldn't be a bad thing, and wasn't. But neither was it memorable. Earthkwake was even less memorable. The program listed the lead singer, Nathaniel Stringfield, as drummer. In concert, there were a series of other drummers sitting in, and he did a fair job as vocalist. Had he sung more, instead of spending most of the time working the audience, I might have been more excited. Instead, despite Stringfield's high energy, I felt mildly manipulated and pretty bored. A final set with both groups together did click somewhat. They covered a nice range of gospel and Jewish religious pieces tightly, and still with the energy that was the main feature of the earlier sets. Notable were nice renditions of the Jimmy Cliff "By the rivers of Babylon" as well as "Oh, Rachel don't you weep." I admit that the Sunday afternoon Jewish Community Center audience seemed to thoroughly enjoy itself. I heard one person, on leaving, say that if HaZamir had recorded today's show, he would love to buy the CD. But, to me, it felt like surburban strip mall entertainment—and while the Newton, MA JCC's demographic certainly includes suburbanites, they tend to book more interesting shows (hey, they booked the KlezmerShack's 10th Anniversary party last year!). I should mention by way of example, that Brave Old World will be presenting its "Songs of the Lodz Ghetto" on March 17-18, as one obvious example of "more interesting shows," so let me close on that more positive note. I've seen BOW perform this piece several times over the years. It has evolved over time, but it has never been less than powerful and thoroughly absorbing. Stay tuned. 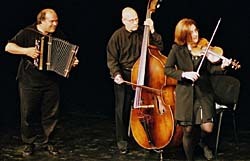 The amazing trio Veretski Pass, celebrated the finishing of their second CD this past weekend with a wild concert for the Branford, CT, Folk Music Society. I am thoroughly jealous that the Branfordians were not only able to snag the band for its debut East Coast performance, but filled the hall. This is a band that belongs here in Boston at, say, Johnny D's. If booking agents read this blog, you've been warned that there is exceptional music that attracts an audience. Now do your part! Featuring Cookie Segelstein, one of my favorite fiddle players, Stu Brotman, boss of the bass, punisher of the poyk; and Josh Horowitz (with all due respect to some amazing tsimbl players that I know), the only tsimbl player to call when you want the best, on that instrument and on accordion, the band plays something they call "Village Klezmer," a wild, ecstatic melange of Eastern European music, often Jewish, always fascinating. They featured a lot of newer material, and managed to slip in a bit of Fellini film score here, Mariachi there, just to keep things interesting. Despite managing a thoroughly staid stage presence—Cookie moves a bit while playing, and one can see Stu's hands move as he bows the small "Hungarian Village bass", the band managed to get several audience members up and dancing, and the rest of us clapping along. Having a full evening in which to play, Cookie and Josh also took time to amuse us with intros to songs that didn't necessarily have much to do with the music, but reinforced that frequently-felt sense that we're all from Munkacs, anyway. There aren't a lot of bands playing traditional music that sound this exciting. Please join me in figuring out how to get the band performing locally (especially locally to me so that I don't have to shlep down to New Haven). With two members now settled here on the East Coast, surely there are many excuses to pull in Stu from Berkeley and set up a tour. On a lovely spring day a couple of weeks ago, just after the goyishe New Year, I saw Naftule's Dream for the first time in ages. The setting was the Forsyth Chapel at Forest Hill's Cemetery here in Boston. The cemetery is one of at least a couple in Boston designed to provide a lovely place to picnic and to commune with the dead. In this case, although the band ended with "Black Wedding" from their very first CD, both the living and dead were very much at peace. Although, thinking of the intensity and wonderful disharmonics of some of the band's music, that might be a minor mis-statement. The band started off with some quieter new material, perhaps in keeping with the setting, but with the audience's approval and occasional nods to the klezmer music that gave them their name, the music got louder and more intense. The new pieces sound different—those showcased here were quieter and perhaps closer to chamber music in some ways that earlier, more prog-rock inflected numbers. Relatively new trumpeterGary Bohan was featured on at least one number, as were several by accordionist Michael McLaughlin. As usual, I left at peace, with some of my inner chaos expressed, and ready to see them again, soon. The only thing that could have made the event closer to perfect would have been the Isaac Bashevis Singer material that they worked up years ago and never recorded. Yiddish ghost stories for a New England cemetery—that would be pretty slick. "This may be old news, but while searching for a tune for "Shoshanos Yaakov" for Purim, I came across this incredible site of online, full-length nigun recordings, www.chassidus.com/audio/nigun/. There must be about 100 recordings, most with commentary in a real geshmakt chassidic yiddish. Many sound like vintage recordings. A real treasure trove." But wait, there's more! Andy Tannenbaum writes about www.piyut.org.il (and www.piyut.org.il/english/). They have well over 1000 recordings of piyutim (including nigunim). I don't make it to so many gigs these days, but this past month or so I have caught several excellent shows. Time to get the word out and offer shout outs to the folks who brought the music. Back in December, Heeb Magazine and JDub Records co-sponsored a tour called "Jewltide" that caught several east coast venues (there was a different tour on the West Coast. This follows a trend in recent years of filling that December time of alienness—the awareness that the great Jewish holidays do not include Hanukah, which is not a Jewish excuse for consumer potlatches (Christians often say the same about Christmas, but they're the majority culture, so if it bothers them, it will change.) So, there is Jewmongous, Jewltide, the "Nice Jewish Girls Gone Bad" tour and more. Of them all, the Jewltide show in Boston seemed most like a "here's what's new and edgy in Jewish music" review. Of course, not even four bands can represent the breadth of cool stuff happening, but if you had to pick four bands, Shtreiml, SoCalled, The Levees, and Golem are an excellent set. I have to say that the relevation of the evening was Shtreiml. I have heard their CDs, including the new one, the Turkish-Klezmer fusion, "Fenci's Blues", and long been a fan. I've seen the band perform their traditional sides at KlezKanada. But here, at TT the Bear's in Cambridge's Central Square, they demonstrated their rockier side, and rock they did. I finally get the comparison to "Blues Traveler". One song, that I did not recognize, but thoroughly enjoyed, felt like "Bo Diddley meets klezmer." I was a Shtreiml fan before the concert. I am even more of a fan now. SoCalled, who was part of Shtreiml in its earlier years, sat in for a reprise of "Halevai," one of my favorites. His own set featured familiar beats. He didn't seem to connect with the audience in the between-songs patter, and something was not happening between him and the bass player from Shtreiml who, along with Khevre clarinetist Michael Winograd (also touring as part of Shtreiml). Towards the end of the concert he brought on the bass player from Golem. For all of that, the music was just fine. His hip hop deconstruction of "Ikh bin a border bei mein vaib" is near-classic. At this point, we got "the LeeVees," two pop artists who have toured the past two Hanukah seasons with "Jewish" songs. I had been looking forward to seeing what the duo sound like in concert and was not disappointed, although it's just as well that the band appears only in that season. Fluff, playing on our "Jewy" (the band's term) feelings about "Apple sauce vs. sour cream" or "My goyim friends" is fun at the solstice, but it would be hard to make a year out of it. Apparently the band usually appears with a fuller band. To allay any concerns about hearing just the two of them, the Leevees distributed several boxes of donuts prior to the set. Finally, Golem rocked out, and I gotta say that any evening of music where half of the performing bands include trombones, has to be good. I am a major fan of the intensity of Annette Ezekiel (accordion, vocals) and Alicia Jo Rabins on fiddle, with an equally intense mix of trombone, bass, and ferocious drumming. I find the theatrics and lounge stylings of vocalist Aaron Diskin distracting, but I seem to be unique in this regard. Besides, there are other punk bands playing Yiddish and Balkan music. How many punk-lounge bands are there? The dance floor at TT the Bears was quite crowded, as was the rest of the building. There was a nice mix of people, including several kippoth—it wasn't just secular Jews coming out for a touch of "feeling Jewy". This was the sort of audience that wanted to hear interesting music and was happy to come out on a cold night to hear it. Jewish music revues may be a new December "tradition," but I'm looking forward to removing the quote marks as this becomes a real tradition.